Some of you may know that I’ve recently started a video series on Facebook Live where we’re discussing a different Anxiety management technique each week. These are held on Thursday evenings at 8.30pm BST over on The Butterfly Mother Facebook page. This week’s topic is going to be all about “getting comfortable being uncomfortable” and how this technique of giving up the fight against anxiety helps me more than any other medical or self-help technique combined. I stumbled across the idea when hunting for a “cure” online during my Postnatal Depression. 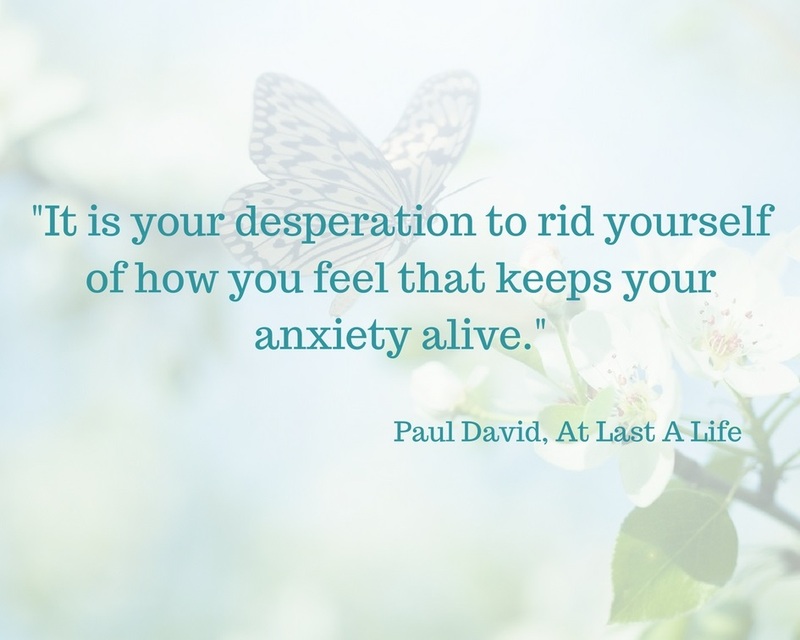 I found a website called Anxiety No More and bought the creator’s book – At Last A Life By Paul David. Much of what I’m going to share I learnt from Paul’s book but I have since found similar techniques discussed elsewhere too, and made subtle changes myself. When planning for the video, it dawned on me that I’ve never actually dedicated a blog post to this concept. So today I wanted to share what I personally believe to be the most useful way to handle unhelpful thoughts and Anxiety symptoms, and how detrimental it can be to continue to do the opposite. 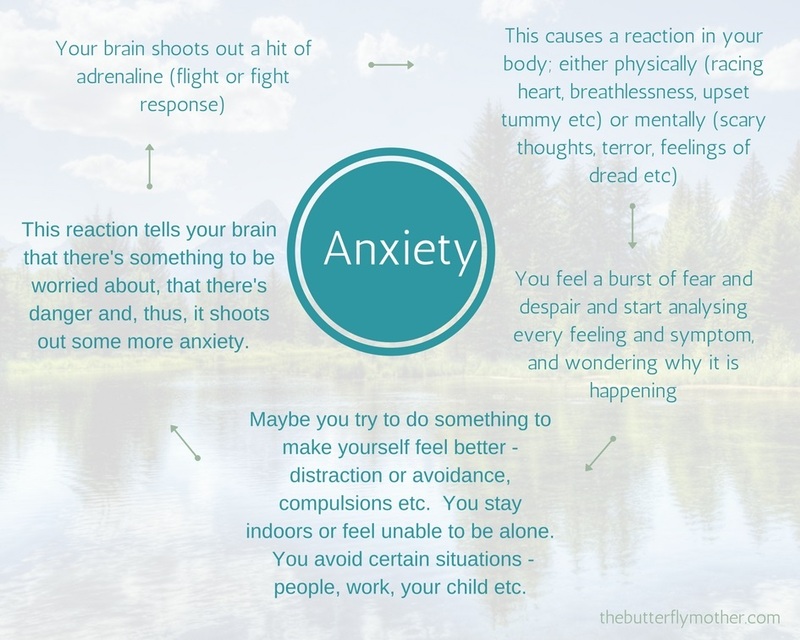 Firstly, it can help immensely to understand more about what anxiety actually is. When we’re ill we see Anxiety as this hugely frightening, terrible thing but, actually, it’s a simple, necessary part of being human and it cannot be gotten rid of. When people have difficulties with alcohol or drugs, the way to recovery is to completely eliminate those substances from their lives. You can’t do that with Anxiety. It is a necessary part of brain function that keeps us alive. When you’re about to cross the road and you suddenly see a car speeding towards you and you quickly pull back – that’s anxiety. If you return to your house to find a window broken and your heart races with fear – that’s anxiety. Anxiety is the body’s fight or flight response and it’s required when we’re in danger or facing an aggressor. It was much more useful back in the caveman days when our lives were built on a more primitive level but it’s still required today in high-octane situations like war or medical emergencies. When you’re suffering from an Anxiety disorder (Generalised Anxiety Disorder, OCD, Postnatal Anxiety etc) the part of your brain that creates the adrenaline needed for fight or flight has gone into overdrive, and you’ve become caught in a vicious spiral of fear & reaction. One of my therapists helped me to understand that Anxiety isn’t necessarily a “mental illness” – it’s just a condition where your brain’s normal anxiety balance has been knocked off kilter. This idea helped me a lot. The nature of anxiety, i.e. the fact that it’s purpose is for use during dangerous situations, means that we instinctively cower away from it. The sensations created by that excess of adrenaline can feel utterly unbearable and, if experienced constantly over a long period of time, can have devastating consequences on our ability to 1) carry out everyday tasks and 2) experience other, more positive emotions. The first thing we instinctively want to do with anxiety symptoms is to push them away. It feels uncomfortable, we don’t like it, and so we try to get rid of it. This is the biggest mistake you can make. Everyone has their own way of surviving their Anxiety – coping strategies, distraction, medication, lifestyle changes etc. 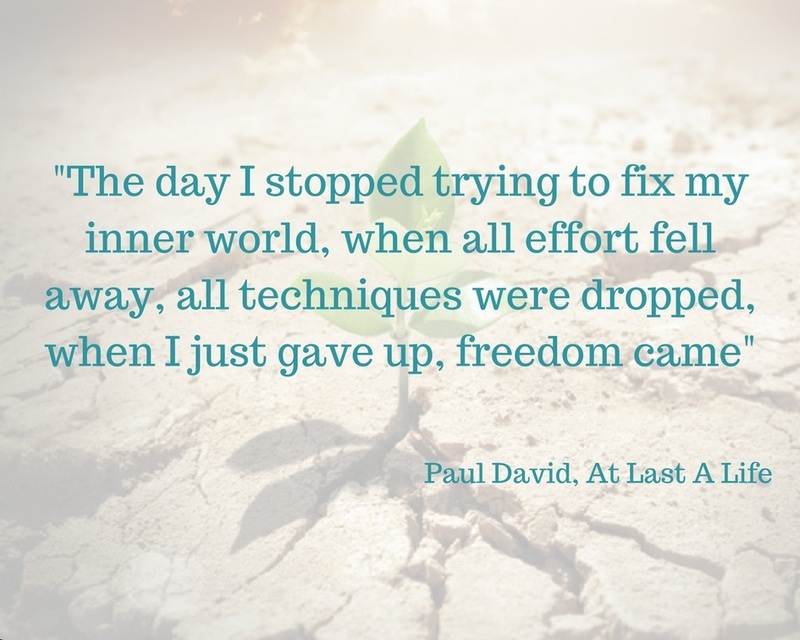 But in my experience, and in the experience of many other sufferers I’ve met in the last four years, the very best way to deal with anxiety is to simply give up the fight. You have to let the anxiety in. You have to tell it to come in. When that wave of Anxiety rolls through you and all you want to do is run away (flight) or push it away (fight) you have to sit with it instead. You have to be present with it and allow the horrible, uncomfortable feelings to travel through you. You have to learn to get comfortable being uncomfortable. The very first thing I do is remain still and take a deep breath. As I breathe in I imagine I’m breathing in all the anxious feelings and horrible thoughts. In my head I imagine actually stepping towards Anxiety. It feels wrong and unnatural but it works. (When I first began practicing this technique I actually imagined Anxiety as a physical being – a dark, spiky version of myself. Once I got more practice I was able to let go of the images and just focus on the thoughts and feelings). I let whatever weird thought or horrible feeling is attached to the adrenaline come into my brain and I don’t argue with it. I try not to engage too much with it at all, in fact. I just say “oh hi, you again. Thanks for coming but I don’t actually need you right now.” Then I let it do whatever it needs to do and watch it disappear again. I practice not being afraid of the Anxiety, and not getting angry with it either. It just is. Once you sit with it those first few times you’ll probably feel a subtle sense of relief. It’s our natural instinct to tense against panicky feelings but the freedom that comes from allowing it in feels so much better. My brother-in-law actually eggs it on and this works great for him. 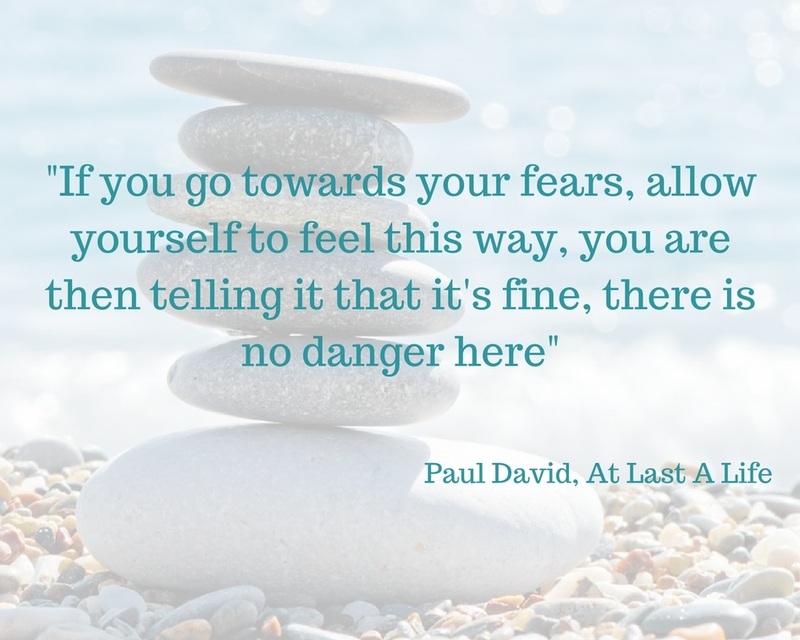 He’ll say “Come on then, do your worst, you’re not going to stop me from doing anything today.” Anxiety feeds off fear so once it realises you’re not afraid and, in fact, you’re not particularly bothered by it it will dissipate. I take a more passive approach to mine but it works just the same. How Do I Get Comfortable With Anxiety? I’m not going to pretend this method is easy. It takes a long time, an awful lot of practice, patience & repetition and, frankly, a hefty chunk of blind belief. But it is the best way out of anxiety hell. The first thing you need to do is believe that Anxiety & Panic Attacks cannot kill you. Neither can they permanently alter your mind and the process is completely reversible. I know it’s so, so difficult to believe this – I’ve been there, several times. But you’re just going to have to take my word on this (and the word of lots of professionals and previous sufferers). Whatever symptoms you have let them be there, don’t start looking them up online or trying to find quick cures & quick fixes. Just put every single symptom, physical, mental or emotional, under one big umbrella called Anxiety and treat them all the same. With a shrug. With an “oh well, come on then, do your thing and I’m just going to be off over here doing mine”. Importantly, carry on with your life. Avoiding certain places, people or activities only tells your brain that there is something to be afraid of. Carry on your life as normally as possible, completely disregarding how you feel. I can’t stress enough how much practice this method takes. Sadly, you can’t just invite anxiety in a couple of times and expect to feel fine overnight. It’s a hard slog and you have to keep at it. Chances are you’ve been reacting the “wrong way” for quite a while so equally it will take time for your brain and body to get used to this new way of thinking. You will need to do this every time the Anxiety comes – this meant several times a minute when I was at my worst. You’ll have times where you’ll forget or be too tired and it will get a grip on you again but, as soon as you realise, just start inviting it in again, and that relief and sense of control will start to return. Also, beware of subtle differences in how you think you’re dealing with anxiety and how you actually are. During my recent setback I panicked because I couldn’t understand why this method wasn’t working anymore but actually, when I really examined what I was doing I wasn’t doing it quite right. Being frustrated, aggressive or angry towards the anxiety doesn’t work, you have to either befriend it or show it indifference instead. 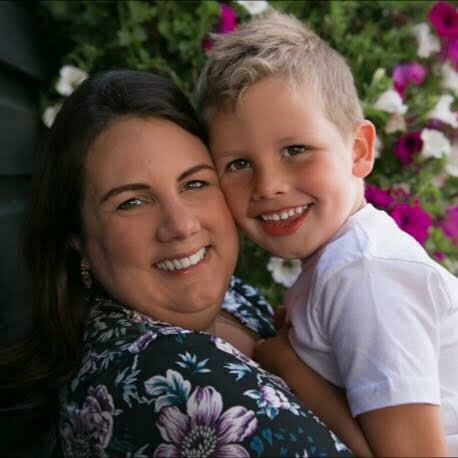 I’d love for you to join me for Facebook Live on Thursday evening where we’re going to discuss this method in more detail and I’ve written more about this technique in the posts below (all my PND & Anxiety content can be found here). 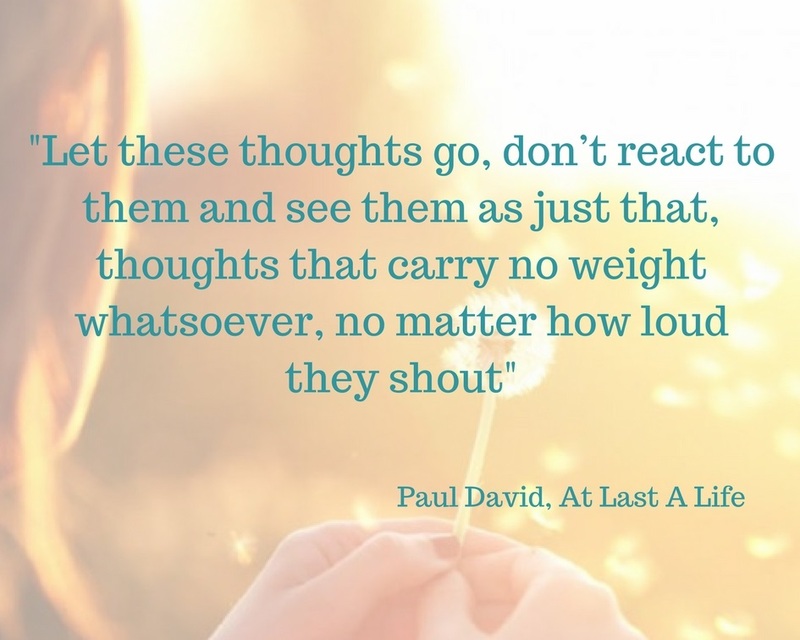 If you’d like to find out more about the wonderful man who basically saved me from anxiety check out Paul David’s book & website. Hey, Laura, I really liked it very much reading your blog. Lots and most of us go through their tough times. We all have this anxiety at one or the other point in time. And, we all deal with it differently. A few people take it as a disorder and panic more, so they take treatments and therapies for the same. But, I really liked the way you said that anxiety is a part of us and we face it quite frequently in a day on a number of occasions as you mentioned. Just the frequency or the level of anxiety increases and we feel abnormal. Your blog has inspired me a lot I can say. Can’t say about others but, I feel a lot of encouragement because I go through this anxiety a lot of times, especially when I find myself alone in a situation and it takes me. But, I will definitely try to practice this thing as you have discussed here. Thanks a lot, Laura. Keep up the good work.